The first Hussars are thought to have been Serbian nobles seeking refuge in Hungary. Well renowned as elite light cavalry, those that remained in their native land prefer to take lucrative work as mercenaries, since they are much in demand. 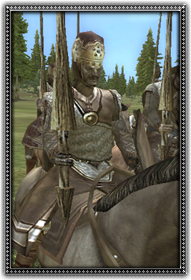 Hussars are equipped with light mail, shield and armed with lance and sword.